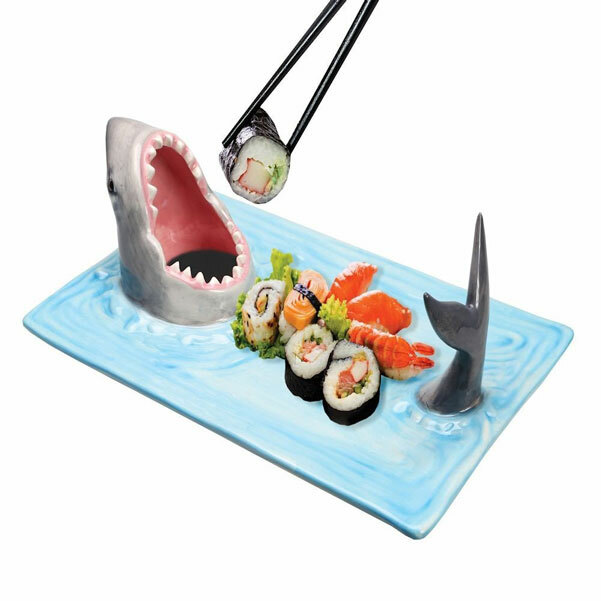 Shark Attack Sushi Serving Platter: lets you serve sushi to your guests in a more fun fashion. Great for chips, dips, and other foods too. 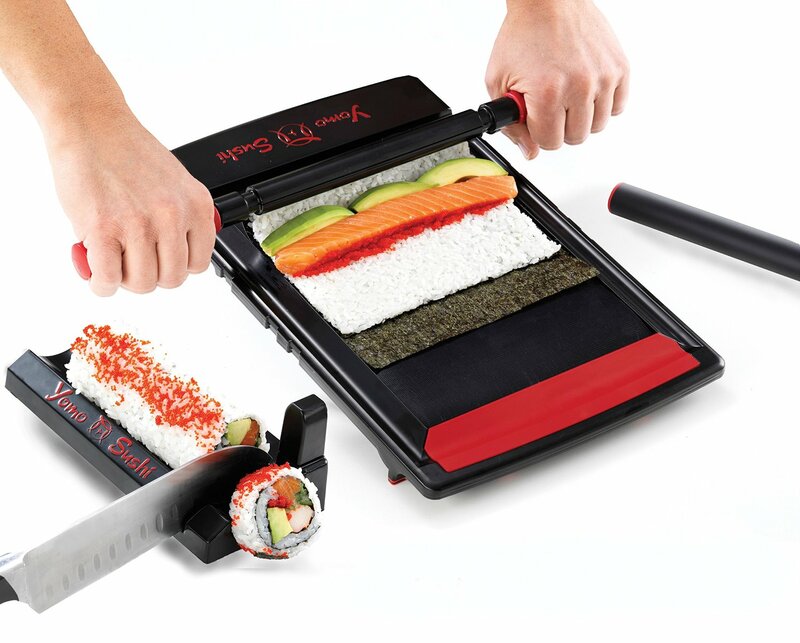 Allure Sushi Maker: a handy sushi rolling machine with locking clips that lets you make a perfect roll every time. Autec Robotic Maki Folder & Cutter: a robot that prepares your sushi fast. 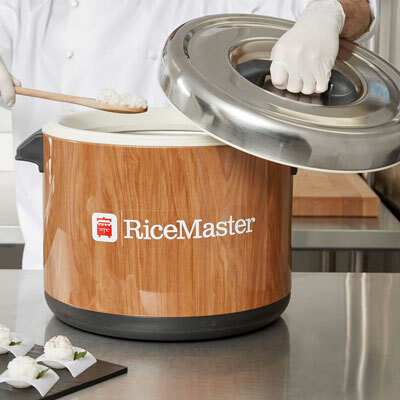 It makes 450 rolls per hour and keeps the rice at the right temperature. 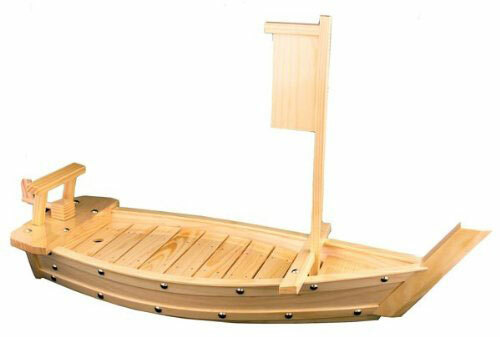 Bamboo Sushi Tray Boat: as the name suggests, this boat lets you serve sushi like a pro. 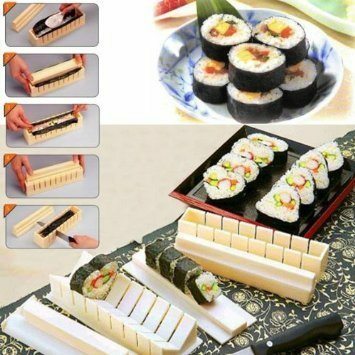 Yomo Sushi Maker: a simple tool that lets you prepare sushi rolls in 4 steps. 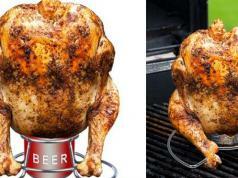 It comes with a guide and roll cutting board. Star Trek U.S.S. Enterprise Sushi Set: makes a great gift for Trekkies. It comes with plate, chopsticks, and soy sauce dish. Skull Soy Sauce Dish: a cool sauce serving dish for your meals. Comes with chopsticks to go with it too. Autec Sushi Maker: this machine can produce up to 2400 rice balls per hour. 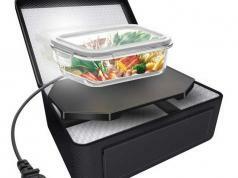 It keeps the rice at the ideal temperature and lets you change the density of your rice ball. 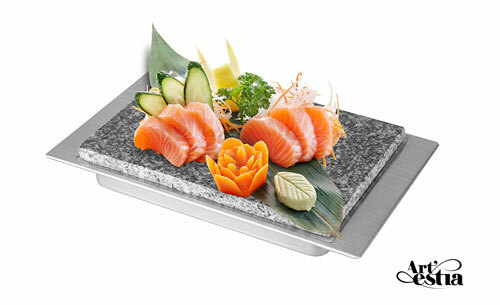 Portable Tabletop Sushi Conveyor: useful for restaurants and anyone who serves lots of sushi. It has a modular design with adjustable speed. ASM835A Sushi Machine Rice Sheet Maker: remembers 4 kinds of settings and keeps the rice at the right temperature. Lets you try any filling size. Sushezi: a sushi bazooka that allows you to use your favorite ingredients to make your sushi. 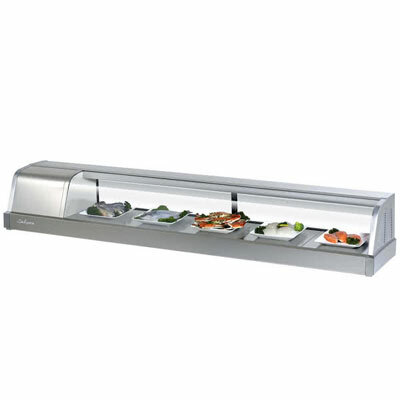 Turbo Air SAK70L-N Curved Glass Refrigerated Sushi Case: has a stainless steel exterior. It maintains the temperature between 35 to 41 degrees. Town 18 Qt. Sushi Rice Container: makes up to 96 cups of sushi rice. It has a fully insulated body and woodgrain exterior. 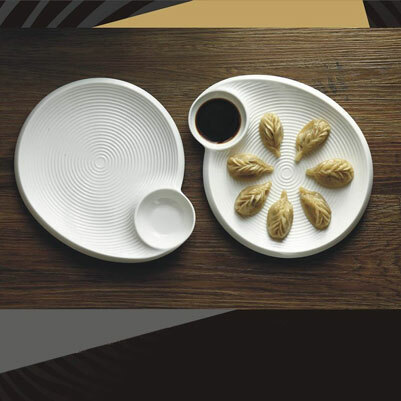 77L Ceramic Sushi Plate: a sushi plate with a dipping saucer. It is great for chips, dumplings, and other snacks. Artestia Cold Stone Sushi Set: comes with a stone set with stainless steel tray for serving sushi, desserts, and everything else. 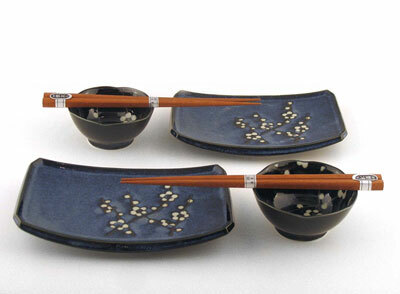 Namako Blossom Sushi Set: comes with 2 elegant plates, bowls, and chopsticks for you and your partner. Heart Shaped Sushi Maker: lets you make heart shaped sushi. You also get square shaped molds. 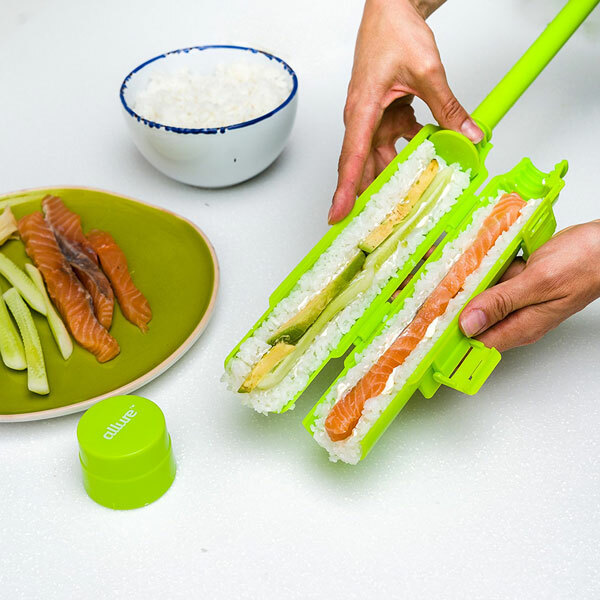 Have you found other rad sushi makers and sets? Please share them here.